Changes to the rules saw presentations for the national top jockey and trainer titles made two weeks ago rather than at this meeting. So rather than ending on a seasonal high the year ends with a bit of a damp squib, fittingly on Bonfire weekend. The feature race at ‘Donny’ is the November Handicap. Last year Open Eagle did this column a massive favour by winning this race having advertised his credentials by winning over course and distance in late October. This year’s winner of that same prep race was Argus who will be carrying my money on Saturday. He’s a lightly raced three-year-old who looks to be able to handle soft going. Richard Fahey’s Latenightrequest could be the one to chase him home. Mobsta won as a two-year-old on this card last year and is fancied to win again a year later. He escapes a penalty for a win on soft going at Newmarket last week and should relish the underfoot conditions. The 1:50 race is dedicated to jockey Hayley Turner, who has her final rides of an illustrious career on Saturday. She is down to ride Hillbilly Boy for Tom Dascombe and could very easily win her ‘own’ race. Hillybilly Boy has recorded two wins on soft ground, one of them at Doncaster, and is much more than just a sentimental selection. Indeed William Haggas has also booked Hayley for his promising filly Bella Nouf. Based on her win in October she must also have a good chance of giving Ms Turner a farewell winner. Finally, Dorset trainer Colin Tizzard captured the Charlie Hall Chase at Wetherby last week with Cue Card and I fancy him to win the big chase at Wincanton. 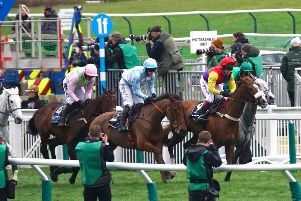 Theatrical Star represents the in-form yard in the Badger Ales Trophy at Wincanton. He won at the second time of asking last year and should improve from his recent fifth at Cheltenham.